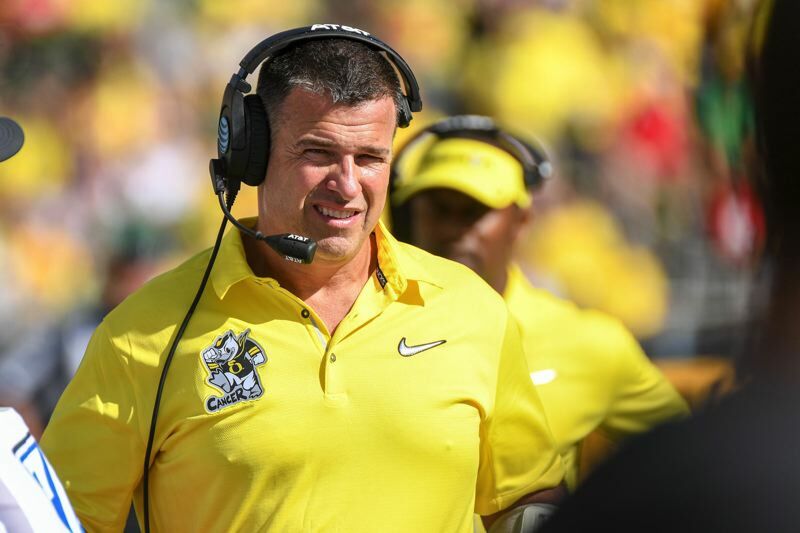 Mario Cristobal was named Oregon head football coach on Friday, and a slogan such as his predecessor's "Do Something" wasn't immediately known. But Cristobal described what kind of a coach he will be, and how he will treat his players. "Do it every single day as if you're coaching your son," said Cristobal, who served as co-offensive coordinator and offensive line coach before being promoted to head man. "It doesn't make you kinder or gentler, but it's to maximize the potential of every single student-athlete in the program. This is their final stop, after this it's on (in the real world). "The important thing to us is we operate on a foundation of trust. When you have that, you cannot be broken." Cristobal said he is very excited to be the new head coach. He had a 27-47 record at Florida International, a downtrodden program when he took over, in his other head coaching stint. "I can't emphasize enough the excitement that runs through me and the locker room, and it's real," he said. "My heart and soul is in this one." And, Cristobal answered the most pressing question, after Willie Taggart bolted from the Ducks after 12 months and one season for Florida State. "We want to be here till you gotta drag me away, kicking and screaming," he said. "We let it be known. I want it to be known. So there isn't chatter" about his leaving for another job sooner rather than perhaps later. He said being honest, working hard and caring are paramount to him as he builds a stronger relationship with the UO administration and players after Taggart's departure left them not feeling very good. "When you're in the sport of football, you bleed and sweat .. and that's stuff you cannot fake," he said. "That's why we have such a foundation of trust with our players. We (the Cristobal family) fell all-in with Oregon after being here just a short amount of time." The Las Vegas Bowl, Dec. 16 against Boise State, and recruiting are the most pressing issues, but Cristobal "is absolutely convinced" the Ducks can win the national championship under his watch. President Michael Schill was pleased with the hire, crediting Rob Mullens, athletic director. "Rob Mullens moved very quickly to maintain stability," Schill said. "This swift action by Rob will ensure that we don't lose any terrific momentum created over the last year. Rob has shown great leadership over the last year. He's acted decisively, quickly and with imagination." Mullens said he "sat down with several coaches" for the position, "yet something separated Mario from the group," such as his understanding of the student-athlete experience, a desire to compete, his recruiting ability, a love for Eugene and UO, his role as a mentor and a vision for what comes next. Said Mullens: "It's a new era of optimism, excitement, passion and direction." Oregon coaches will lead the Ducks in the Vegas Bowl, after which Cristobal — and, presumably, Taggart — would vie for their services. Cristobal hopes to convince defensive coordinator Jim Leavitt, as well as many of the assistant coaches, to stay with the Ducks. Players signed a petition advocating for Cristobal's hiring. "I can't thank them enough," he said. "The support they shared, the energy and enthusiasm they brought to the table, it's humbling beyond words." He added, of his popularity among players: "We had fun this year, and we got better. If you're doing it as hard and as good as you can, and invest your heart in it, you learn more from players than they do you. ... I was blown away, man. Humbled beyond what anyone can explain." Cristobal said he wasn't hired to be friends with players, but rather to be their leader and mentor. He promised to be tough on them, to build a tough team, even in the next week for the Vegas Bowl. "Play the best brand of football, set an identity and (cement it) in the bowl game," he said. "Be relentless, physical, send a message across the country of what Oregon football is to be moving forward. And, send the seniors out right." The new coach said the Ducks (7-5) have "a strong foundation now, especially at the line of scrimmage. Those guys have played with toughness and energy and knocked back opponents and set the tone on a game-to-game basis. It was much better productivity when Justin (Herbert) was playing. But, I want to give credit to (backup QB) Braxton (Burmeister). He's going to be a great football player. "The foundation is strong, and the best thing is the continuity that this comes with, and there's no anxiety for players going into the offseason. The plan is to elevate the standard." Oregon purportedly has one of the country's top recruiting classes, even though some players have de-committed since Taggart left. It had been tabbed "mOvement18" on social media. His message to recruits? "The movement hasn't stopped, it's only going to get stronger. It's an incredible opportunity for our program to set an idenity (in the Vegas Bowl), that the Ducks are here and on their way up fast," he said. After spending a year at Oregon, which has "completely blown away my expectations," Cristobal cited the contributions of former coaches and players, such as Rich Brooks and Mike Bellotti and Heisman Trophy-winning QB Marcus Mariota, as establishing the strong UO program. "I don't think the entire country understands the standard that has been set," he said. "It's our job to uphold the legacy." Having been in some big games and big-time enviroments with Miami as a player and Alabama as an assistant coach, Cristobal said Autzen Stadium compares to anywhere. "It was deafening, incredibly loud," he said. "Being here for the season and watching Autzen light up and go crazy and bring an energy, whether it be 'Swag Surfin' or air guitar, creates a tremendous advantage for our football team. You gotta bring it. It's deep for us." Cristobal says his parents, who moved from Cuba in 1961 and forged their lives through hard work, served as great influences. He's big on working hard, which goes with his emphasis on power football. "There is no rest in this particular industry," he said. "If you rest, you'll be left behind. What we foster is DNA of being a relentless worker. When you're a champion, you're a champion 24/7."